Common Name: Dipsacus root, Teasel root, Himalayan teasel root. Properties & Taste: Bitter, sweet, pungent and slightly warm. Functions: 1. To tonify the liver and kidneys; 2. To promote the circulation of blood; 3. To strengthen the bones and tendons. 1. Deficiency of the liver and kidneys manifested as soreness and pain in the lower back and knees or weakness of the legs. Teasel root (Xuduan) is used with Eucommia bark (Duzhong) and Cyathula root (Niuxi). 2. Derangement of Chong and Ren meridians due to deficient liver and kidneys manifested as profuse menstrual flow, uterine bleeding and threatened abortion (restless fetus). Teasel root (Xuduan) is used with Eucommia bark (Duzhong), Donkey hide gelatin (Ejiao), Astragalus root (Huangqi), Mugwort leaf (Aiye) and Chinese angelica root (Danggui). 3. External injury. 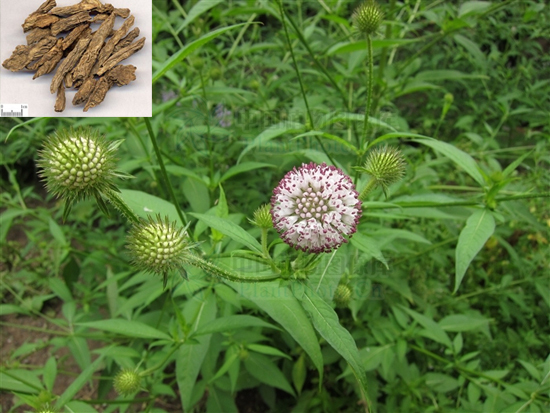 Teasel root (Xuduan) is used with Drynaria (Gusuibu) and Dragon's blood (Xuejie) for reducing swelling and stopping pain. Dosage: 10-20 g, decocted in water for internal use. Used stir-baked for metrorrhagia. Appropriate amount of powdered herb for external use. Cautions & Contraindications: The fried herb is used for uterine bleeding and the powdered herb for external use.